Ask fellow campers about "Delaware Water Gap / Pocono Mountain KOA" and nearby attractions. We were here for there Halloween weekend which had lots of activity's and hayrides. They even gave away a free weekend for best decorated site. The pull through sites on the top of the hill are nice. The fire pits are all custom and the sites with patios are laid out nice. The do come at a high price. I wouldn't want to be in one of them in the summer as there is no shade. This is a good place for the kids as there was plenty for them to do. The jump pad and playground was good. All the kids slept good as they ran all day. Will defiantly be back at this campground next season. There is plenty to do in the area. We have to get used to KOA's prices as they keep going up. As long as service stays as good it is worth the stay here. 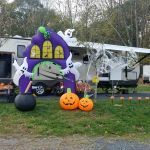 We camped at Delaware Water Gap / Pocono Mountain KOA in a Travel Trailer. Make sure you go to the local flea market as they have lots of good stuff. We stayed here for 3 night minimum for weekend prior to 4th of July. Little pricey for this park but understand why for these 2 weekends Close to neighbors but not unbearable. Wifi not good and Verizon not good but we were parked in a hole. n fact entire park down very low. Folks in office very nice but very busy with hayrides pizza etc etc, We enjoyed the three days of rest but too much money for this park. We camped at Delaware Water Gap / Pocono Mountain KOA in a Motorhome. Nice park, clean, and a great camp store. Lots of construction going on, which is understandable at this time of year. However, didn't care for the enormous power lines overhead of our pull thru site. WiFi was non existent in this area of the park. We camped at Delaware Water Gap / Pocono Mountain KOA in a Motorhome. Rest room up by office needs some new faucets. Last yr here site 126. This yr 90..Halloween for kids. Office girls need to get info on area hike. Enjoyed our stay. 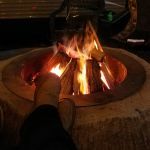 We camped at Delaware Water Gap / Pocono Mountain KOA in a Travel Trailer. County road leading to campground is narrow and twisty but doable in a large RV. When we arrived, the office upgraded our standard back in site to one of their deluxe pull thru patio sites because of our military service. The road leading to the pull thru site is up hill and a tight right turn. Site 50 amp service, leg 1 - 120v, leg 2 - 120v. Stable power. Water pressure 58 PSI. Our site was level and good satellite TV reception. Good Verizon cell and data. Deluxe patio site very nice, good patio furniture and nice fire pit. Wish we had the time to enjoy the patio but we only stayed one night. Campground host has three adorable rescued Papillon dogs. Since we have a Papillon too, we had a good visit and learned how to rescue a Papillon. 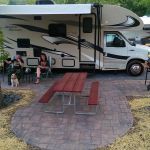 We camped at Delaware Water Gap / Pocono Mountain KOA in a Motorhome. Have dinner a 'The Big A' restaurant. Very good food. 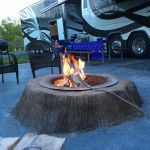 We were a little concerned when we pulled in here for the first time, two cluttered seasonal sites and powerlines greeted of us, however, we were very impressed with this KOA overall. 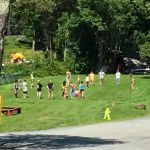 The staff was extremely friendly and helpful, all the sites were level and well-maintained, and there was a lot for the family to do including a live concert Saturday. We've already booked again for next year. 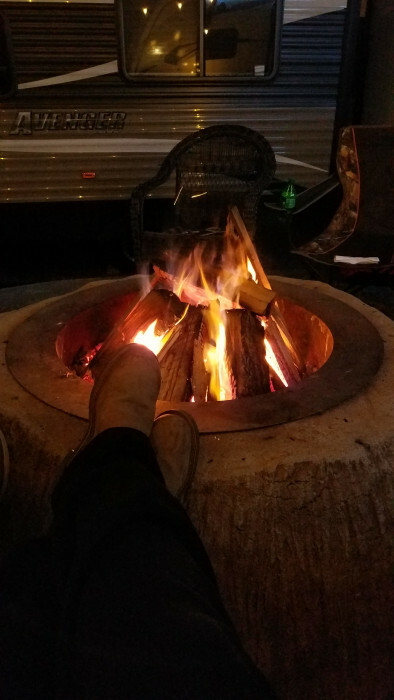 We camped at Delaware Water Gap / Pocono Mountain KOA in a Travel Trailer. The office was perpetually busy, so it was difficult to ask for help. However, I did ask about good places to hike and was advised to get a brochure somewhere because she wasn't sure. Fortunately, there are lots of online resources, but the staff isn't very helpful in that area. There isn't much shade near the RV sites. We camped at Delaware Water Gap / Pocono Mountain KOA in a Motorhome. Make sure you have a car to get to the good hiking spots. The campground was great. My family love it. The only thing I can say is the guest cost could be a little less. Instead of $10 per person regardless of age. I feel say 16 and under should be $5 and adults to 65 should be $7 over $65 back to $5. We had 5 family members come visit us and the thought of paying $10 for my mom who is 66 for her to basically sit with us eat with us and only use the campgrounds restroom. I feel $10 is a little steep. Other than that cost I feel this is a wonderful KOA and would stay there again just wouldn't have guests or visitors while there. The staff on the golf carts were driving around at top speeds,moving very fast through the campground even though the campground has a 5 MPH speed limit, with the little green guys that say slow. Too fast if they want the campers to obey the 5 MPH then so should they.. We camped at Delaware Water Gap / Pocono Mountain KOA in a Travel Trailer. Ok the staff was pleasant but that was about it. Campground has massive buzzing power lines running through it. Place is outdated but appears they are trying to make upgrades. Pool small and crowded. No fishing lake. Hard to understand what we paid for. Short ride to Smithfield beach on Delaware River was a plus. We camped at Delaware Water Gap / Pocono Mountain KOA in a Motorhome. Canoe or raft down Delaware River. We have been to this KOA before and we were pleasantly surprised how much work had been done in upgrades. 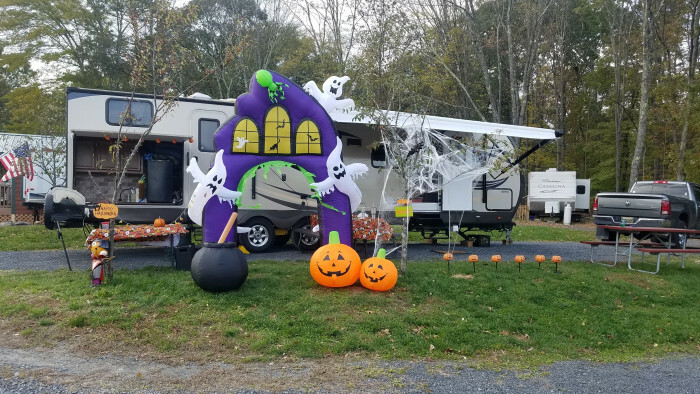 This campground is convenient to the Delaware Water Gap, Poconos and Bushkill Falls. Staff was extremely nice, and I had changed our reservations twice for this particular weekend, they were courteous and professional. 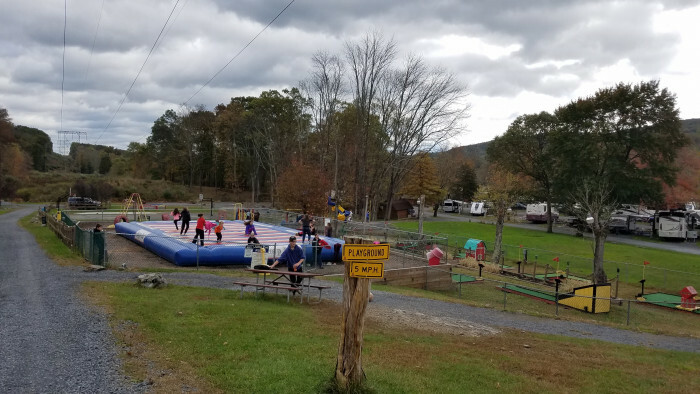 While our kids are grown this campground offers a lot of activities for kids. I would recommend this site! 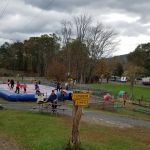 We camped at Delaware Water Gap / Pocono Mountain KOA in a Travel Trailer. We stayed in a pull through site with a patio and it was nice. Campground was empty as we stayed on 3 weekday nights in October. Fairly old school and not much to write home about but we had a great 2 days of hiking some great trails and spending some family time together. Very safe and the ladies at the counter are very nice. Easy to get to. Highly recommend the pull through with the patio! The other sites looked, well, just ok. We camped at Delaware Water Gap / Pocono Mountain KOA in a Fifth Wheel. We have stayed here a few times and it continues to improve. They have added new full hookup sites and improved their recreation facilities. However we can't maneuver their roads with our 40'er + toad. We have to unhook. Otherwise it's a great place. 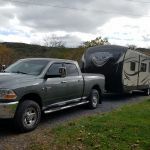 We camped at Delaware Water Gap / Pocono Mountain KOA in a Motorhome. If you have children, you will love it here - there are all kinds of things to do. But because of that, it is very noisy and busy. There is a lot of road noise also. But the staff was very friendly and helpful and the showers were spotless with plenty of hot water. Also, they give you an arm band when you check in and they are very adamant about you having that with you at all times. 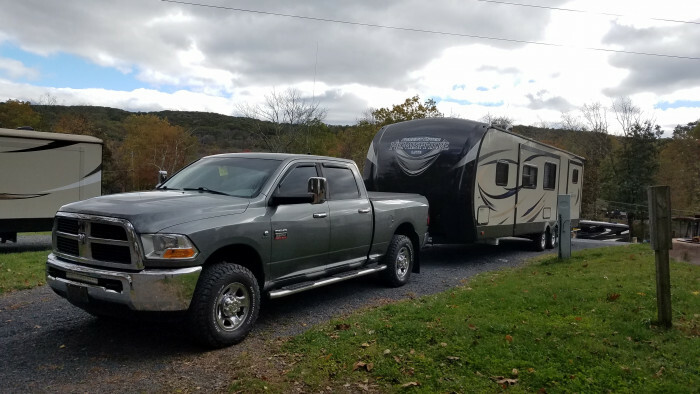 We camped at Delaware Water Gap / Pocono Mountain KOA in a Fifth Wheel. Stayed in an Elite Patio site, ##71. The Elite Patio sites have a fire ring, picnic table, grill and another table and chairs all on a concrete patio. We had no need to set up our usual stuff. The roads getting to the campground were tight, so take your time. The roads in the campground are also a bit tight. The site was mostly level, although I had to get off the jacks, back up a few feet and re-level to get it within limits with no blocks. As before, the staff was helpful and very nice. 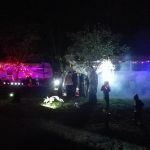 The campground has many activities every weekend, a DJ this particular weekend. It was very hot so we didn't walk around much. The site next to us, also an Elite Patio site, had a power line right across the site, about 14 feet off the ground. And lastly, they now require each occupant to have a wrist band to prove that you belong there. It's to keep outsiders from using the facilities, but it's a little over the top. We will camp here again. We camped at Delaware Water Gap / Pocono Mountain KOA in a Motorhome. The road to the CG from the highway has a very sharp right turn when approaching from the South. There is a small road that eliminates the turn that the GPS didn't pick up. Check your map. 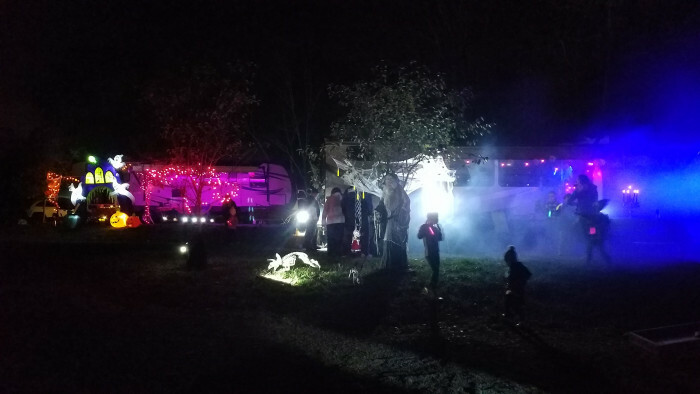 Are you affiliated with Delaware Water Gap / Pocono Mountain KOA ?